She could hear the crying of her two dear little ones. “Mommy. Fluffy Bear’s all burned up.” Fluffy Bear had been Emily’s favorite toy for all five years of her life. “Monkey. Dolly.” Gwennie was just shy of two years and sobbed, lamenting of her two best friends who she took to sleep with her each night. Written for this week’s Friday Fictioneers photo writing challenge hosted by Rochelle Wisoff-Fields. The idea is to use the image above as a prompt to create a piece of flash fiction no more than 100 words long. My word count is 86. 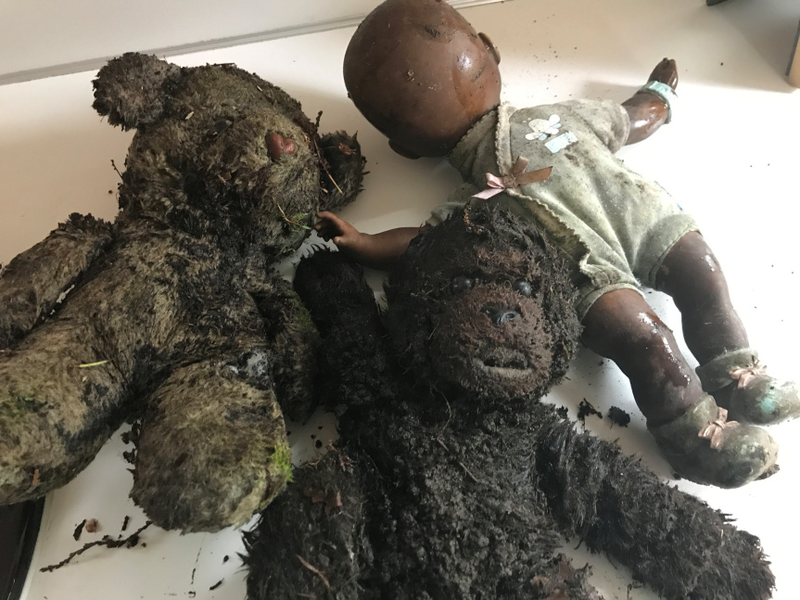 I have grandchildren who have their favorite toys, dolls, and stuffed animals, and seeing the ones in the photo burned up only emphasizes that there are more important things to lose…and save. Wow. That’s very high praise. Thank you. I’ve been reading a number of the other stories based on the prompt, and there are several that result in killing a child or children. That’s not my first response to burned toys. Burn the stuff if you must, but save the kids. Mine fit well with my wip ‘The Return’ so the kids had to go. True, but mine couldn’t let the kids die. Great story, James. That’s all. Touching story, James. Seeing discarded/damaged toys always brings a tear to my space-eyes, because I know that the particular toy represents somebody’s childhood. There are absolutely things worth saving more, but it still chokes me up to think of the personification of a kid’s childhood being cruelly snatched away. My too Spaceman, more than you could know. Appreciate the almost happy take on the prompt, James. Beautiful story . The title is brilliant as is the last sentence . A touching tale, James. It made me want to give those kids a hug too. There were some lost near here recently in a house fire. Glad these two made it out alive. That’s very sad, Russell. Just a few weeks ago, a five month old left alone in a car died. Mom’s boyfriend forgot about him. Toys can be replaced, children can’t. Touching story that made me want to hug the kids and bring them new stuffed animals. Nicely done. Thanks, Rochelle. A few years back, my grandson’s favorite stuffed animal, a giraffe, was lost. It was somewhat unique, but we found an exact duplicate on eBay. I love the line – who needs to be grown up at eight years old. Who indeed! I think that was written in another story but thanks. For me this is a story to treasure, it tells me so much, but leaves me wanting to know more. Such a sweet story with a happy ending. Loved it! Mum had it right, but her babies will always mourn their lost loves. Great take. Such a heartwarming tale. Delightful. Truth. All our cherished possession dim compared to our children and their children. mom must have been relieved that her dearest treasures were safe. great story. Touching story. I can understand the children’s distress at losing their toys, but you highlight what is important.